History: Coming from a hospitality oriented family, I started work experience on weekends and school holidays with my uncle, gaining as much knowledge and experience in food preparation as I could. I also did part-time work in local establishments, completed VET studies in hospitality and, upon completing my HSC in 2001, started my apprenticeship at a locally known restaurant where I spent the next three years under chef Jason Stanley. With his teachings and knowledge I was cooking, creating dishes of flair and catering for multitudes of patrons, which gave me the power to retain my composure under pressure and influenced the chef I am today. After completing my apprenticeship I realised my passion for food had grown and, loving the arts, I wanted to create works of art with my dishes; I wanted to prepare, cook and serve meals that had visual appeal and a taste to die for. For the next couple of years I worked at vineyards on the Mornington Peninsula, including Max’s at Red Hill Estate and Paringa Estate, working with known chefs which aided in developing my presentation skills and food knowledge. 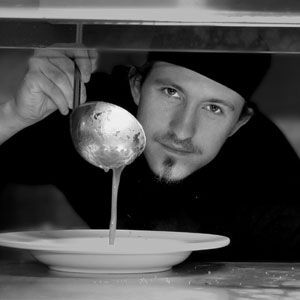 Landing my first head chef job was a challenge to start with, as the restaurant I was in charge of at the time was new. After the first six months, I’d developed sufficient confidence and know-how in kitchen operations and could relax and focus on getting my style into people’s eyes and mouths. That’s what happened; diners were impressed by the meals and I had a large returning customer base. Customers enjoyed my style and blend of flavours, and the presentation of my work. Recently working in one of Victoria’s premier steakhouses I used my flair to introduce quality sophisticated dining to a venue which was in need of modernising. This resulted in lots of return business, rave reviews and business growth. I got married in 2007 and now have two beautiful daughters aged four and one. That’s given me the inspiration and desire to open my own restaurant, and in 2011 my wife Jessica and I opened our restaurant Ladle’s in Kerang, a town in the Murray Valley region of northern Victoria. Have you always wanted to be a chef? I first found my love of food in my mid-teens as I decided to study home economics, thinking it would be good idea as it would mean free food at school! This soon turned into a passion for food. To my surprise I flew through with high distinctions and topped my class. When my soufflé was the only student’s that did not collapse I knew then I had a future in the hospitality industry. How would you define your style? I have a broad ranging style, encompassing modern Australian, modern Asian and French touches. Being from the coast I’ve also specialised in fresh seafood; one of my signature dishes is Oysters O’Brien – freshly shucked oysters with an Irish whisky, lemon and freshly picked dill cream sauce. At Ladle’s, I have kept the hearty, home-style country dishes but have incorporated my own personal style into the presentation and taste of the dishes. With exciting new meals and city style dining introduced to the area, locals now have no need to travel to enjoy a good hearty meal or taste new and exciting flavours. I like to keep my style simple, to have the right balance of flavours and ingredients but with presentation being key; diners take their first bite with their eyes. Obsessive compulsive about? As a chef and now a restaurant owner I am obsessive about consistency in the dishes I create. The flavour needs be perfect every time. Good food starts with a clean kitchen; therefore I am also obsessive about the cleanliness of the kitchen. Your greatest culinary influences: My greatest culinary influences have been and always will be my diners. You have to listen to your customers in order to make them happy. I believe any cook can make you enjoy the first bite of a meal, but only a truly passionate chef with a love of food can ensure you enjoy the last. This is what I aim to do. My family has been a big influence on me. Past and present work colleagues have also encouraged me to better myself and exceed in the culinary world. I am also inspired by those who have built their dreams from nothing and gained great respect in the culinary world. An ingredient you can’t live without? One ingredient I love to use is garlic. With its natural immune system healing properties and the aromatic flavour it releases when used correctly, it is an ingredient I can’t live without. Signature dish: We at Ladle’s have a changing menu and for the 2011 winter menu one of our popular dishes is the Ladle’s lamb salad – red wine, rosemary and roasted garlic marinated lamb cutlets resting on baby cos, red cabbage, sweet potato and salad greens, topped with crispy pancetta. Another local favourite is country-style lamb shank in red wine and rosemary sauce, served on a bed of mashed potato and fresh, locally produced seasonal vegetables.